The city of Fenton is conveniently located with access to the U.S. 23 expressway possible from three locations in the city, as well as Fenton Township to the north and Tyrone Township to the south. Major Michigan cities, including Ann Arbor, Flint, Lansing and Detroit can be reached in under an hour. In 1834, a New Yorker named Clark Dibble explored the wilderness along the Shiawassee River on his way to Grumlaw, which is now known as Grand Blanc. By mistake, he found himself on the White Lake Trail. He proceeded north and landed on a spot on the Shiawassee River that he found so beautiful that he decided to stay. By 1836, “Dibbleville” consisted of a handful of people, a saw mill and two small houses that were all built along the river. Dibbleville was at the center of five trails, and several families came to make their homes there. Dibble was among the thousands of people, mostly from the eastern states, who left their homes in search of new territories and land on which to build their future homes and lives. Other settlers, including William M. Fenton and Robert LeRoy, also natives of New York, followed soon after. Local legend has it that the city’s current name came from the winner of a card game in 1837, between Fenton, a lawyer and land speculator, and LeRoy, a land speculator. Fenton won the game, and the town was named “Fentonville,” and LeRoy earned the consolation prize, which was the opportunity to name the town’s main road after himself. Further play resulted in the names of other streets after family members, including Ann, Caroline, Adelaide, Elizabeth and more. 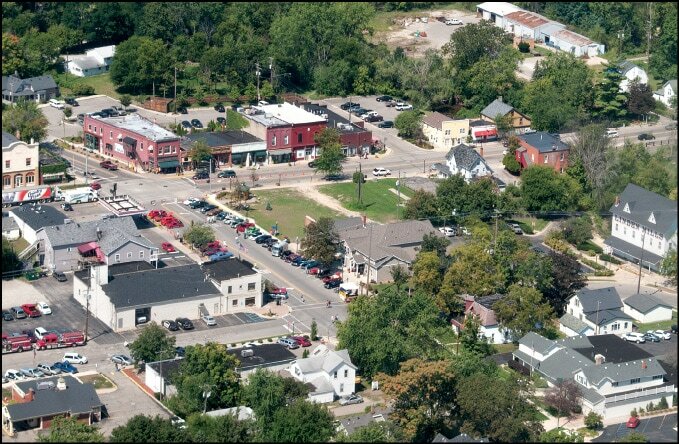 Over the years, Fentonville prospered and in 1863 was incorporated as the village of Fenton. In 1909, the village of Fenton was incorporated and became the city of Fenton. Today, the popularity of the city of Fenton as a place to live, do business, enjoy an amazing meal and just have a lot of fun is evidenced by the booming growth that has taken place in just a few short years. As planned by an active city administration and Downtown Development Authority (DDA), the city has become a true destination for visitors from throughout the state of Michigan and the Midwest. And the growth just keeps on coming. The Horizon Building in downtown Fenton was completed in 2018. It is a three-story structure that features second- and third-floor offices. Residents and visitors are eagerly awaiting the opening of Andiamo, a popular Italian restaurant that features several eateries in and around the Detroit area. Also downtown is the new Ciao Italian Bistro and Wine Bar, another popular Italian Restaurant brought to the city by the folks that own Ciao Amici’s in Brighton. The owner of The Barn, a sports bar and restaurant at Torrey and North roads, has invested more of his resources into the downtown by opening The Fenton Pub, right next to Ciao. Construction on the Cornerstone II building, called 111 Leroy Place, is expected to begin in the spring of 2019. It will take about a year to build and be ready for occupancy in 2020. The four-story building will feature a total of about 41,000 square feet. The first floor of the second building will feature five retail spaces. The second floor will be offices, and the third and fourth floors will feature condominiums. ReJuv Ave. has outgrown its current location in the Dibbleville. But owners are committed to staying in the downtown and a brand new, state-of-the-art building is under construction at the corner of Adelaide and Mill streets. Art continues to be a major focal point in the city of Fenton. Sculptures of all description continue to dot the landscape in various downtown locations. A new and unique butterfly garden was started in 2018. The garden is expected to be completed in the spring with some beautiful winged creatures to follow. Some excitement is brewing on the west side of the city as well. The Kmart building has been purchased and is currently under extensive renovations to accommodate five retailers. Those retailers include T.J. MAXX, Michaels and Five Below. The remaining two retailers have not yet been revealed. The former Bob Evans Restaurant at Owen Road and Silver Parkway, is now home to The Meeting Place, a great new dining experience. Where Pizza Hut and Big Boy once stood is a brand new strip mall featuring retail spaces currently available. Two are occupied, one by Starbucks, which is anchoring the east end of the building and Verizon right next to it. The Fenton Area Public Schools district sold 3.3 acres of its land on Owen Road which is expected to be the future home of an unidentified grocer and a couple of other retailers. The north end of town also is growing with new businesses and eateries locating in existing retail spaces. 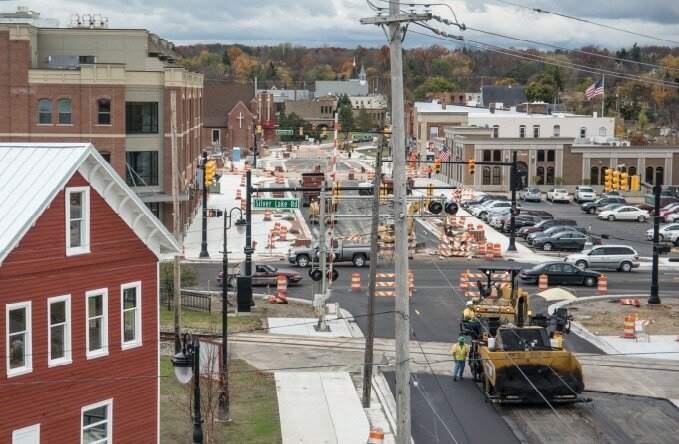 While the rapid growth taking place in the city of Fenton has been a boon for the local economy, the additional traffic generated by a growing population and visitors continues to take a toll on crumbling roadways. After two failed millage elections, city leaders will be busy researching ways to fund much-needed road improvements throughout the city. Despite the tremendous growth that has taken place in the city of Fenton and the surrounding communities, the tri-county area remains a wonderful place to live, work and play. Residents and visitors alike enjoy simple pleasures, such as a stroll along the river or a picnic at one of the area’s many parks. Local events that attract thousands to the city include the summer concerts at the Fenton Millpond, the Fourth of July Freedom Festival, Art at the Center, Farmers Market, Back to the Bricks, Taste of Fenton, St. John Applefest, and Jinglefest at Christmastime. Featuring dozens of lakes and streams, Fenton and the surrounding communities boast a hub of outdoor recreational activities. The village of Holly is located approximately five miles east of the city of Fenton. The community can be accessed from U. S. 23 to Silver Lake Road, east to Grange Hall Road, and from I-75 exits at East Holly Road and Grange Hall Road. The village of Holly has a rich history. For many years, settlers referred to the area as Busseyburg, Algerville and Holly Mills. In the early 1830s, William “Big Bill” and Sarah Gage visited often, and built the first known cabin in the area. Gage was elected to the Michigan legislature in 1842, and contributed to the area’s growth by building plank roads between communities. The first man to settle permanently in the area was Ira C. Alger, a native of New York who arrived in 1836. The following year, the population doubled as his wife, Mary Anne, moved to the area and joined him. Because of the saw and gristmills, Holly attracted the railroad industry. In 1855, the first train rolled into Holly, marking the true start of Holly’s economic growth. While the first set of railroad tracks were actually laid in 1834, it wasn’t until 1853 that the Detroit & Milwaukee Railroad reached the village. Afterward, Henry Howland Crapo later extended track from Holly northward to Flint, making it the first railroad intersection in Oakland County and among the oldest in the state. The railroad years in Holly brought several businesses into town, including 17 hotels and numerous saloons. In the 1870s, a section of Holly’s Martha Street became known as “Battle Alley” as it was often the backdrop for many a barroom brawl that often spilled out into the street. By 1907, word about Holly and its famous Battle Alley reached the ear of well-known prohibitionist Carry Nation of Kansas. Nation traveled to Holly where she continued her six-year campaign against the evils of alcohol, visiting many Battle Alley watering holes, and using her “all hell howl,” and famous axe to make her point. In 1838, Jonathon T. Allen founded Holly Township and became its first supervisor. During that time, Allen named the village Mt. Holly after his boyhood home in New Jersey. The Holly area is comprised of Holly Village, and the townships of Holly, Rose and Groveland. Today, Holly Village, Holly Township, and Holly Area Schools administration are located under one roof at the Karl Richter Community Center. The project will be completed in 2019, with the old building being sold privately, returning to the tax rolls. Growth and investment into village parks is expected to continue. “I would like to audit lakes and landscapes throughout the Village for grooming and enhanced utilization,” McKenney said. In 2018, the village also demolished the old Waterworks Park building and defended litigation challenging its water and sewer rate structure. Holly Township engaged in several public projects, such as initiating gravel road resurfacing, which will continue for three years, dumping 300,000 tons of gravel. The project to revitalize and develop the Holly Heritage Farmstead site is ongoing. The structural foundation for the barn was replaced in 2017, and a master plan is being created to turn it into an educational site. In Rose Township, Supervisor Diane Scheib-Snider said the five-year master plan and parks plan were both updated. The township completed several projects like new approaches on Munger Road and a new 8-inch well for fire suppression. The township also formed an invasive species committee to educate the public on handling invasive species. In 2019, Scheib-Snider plans to seek grants for parks. A 9-hole disk golf course is being considered for Dearborn Park. The township is working with a historical preservation architect to renovate the old township hall located on Franklin Street to meet fire safety as well as Americans with Disabilities Act requirements. The North Oakland County Fire Authority (NOCFA) and Holly fire departments earned an upgraded ISO rating, which can lower home insurance rates in the area. Today, residents are proud of their home’s colorful history, and very optimistic about the future. Businesses continue to open by the dozen, keeping the Holly municipal offices and DDA busy with special activities to maximize and manage their community’s growth. Holly’s historic downtown is a booming shopper’s paradise, with stores and boutiques full of Michigan-made and hand-crafted products, specialty food items, clothing and antiques. Winglemire Furniture and Joseph’s Oak Shop are sesqui-centennial Michigan businesses. Most stores are open after 5 p.m. and have special hours and sales during community events. The North District of Holly provides the necessities of life in one convenient location, including groceries, sundries, dry cleaning, flowers, hardware, and auto supplies. Each year, downtown Holly welcomes visitors to a number of village events including Wednesday night car shows from May through October, Sights, Sounds and Tastes of Holly on the first Saturday of August, and the annual Dickens Festival, a popular Victorian holiday celebration that takes place in downtown Holly between Thanksgiving and Christmas. Just outside the village limits, off Dixie Highway in Groveland Township, the Michigan Renaissance Festival brings in thousands of visitors every fall, luring them back in time to a fictional English village called “The Shire of Hollygrove,” during the reign of Queen Elizabeth I in the latter part of the 16th Century. A large number of patrons also regularly attend the festival in costume further fleshing out the streets with nobles, pirates, Vikings, wizards, rogues, wenches, and an assortment of fantasy characters. For outdoor enthusiasts, the Holly area boasts a large number of lakes and rivers, and two state parks, the Holly Recreation Area and Seven Lakes State Park. There, visitors can enjoy fishing, swimming, camping, hiking and all that nature affords. In winter, skiing and snowboarding await at the Mt. Holly Ski Area. The city of Linden is located approximately four miles west of the city of Fenton, and can be accessed via U.S. 23 to Silver Lake Road. Linden is rich with stories about the hardy settlers who overcame many struggles to make their homes in this community along the Shiawassee River. In 1835, brothers Richard and Perry Lamb built a log home and settled what is now Linden. The following year, many new people arrived to the area, including Richard Newton and Joseph Irving. Two other settlers, Jonathon Shepard and Benaiah Sanborn helped Herman Harris and Consider Warner build what is now the longest-standing building in the city, the Warner Mill, a dual saw and grist mill. Warner and Harris then began drawing how the village would be settled, but just after their plans got off the ground, tragedy struck twice. In the early 1840s, just after the mill construction was completed, an epidemic broke out and infected more than 60 percent of the settlers, half of whom left their belongings and moved away. Less than a decade later, the mills caught fire and burned to the ground, only to be rebuilt again. The 138-year-old mill, a well-constructed building, has become the city’s civic center. Today, the historic mill is the meeting place for the Linden City Council and its various committees and commissions, and serves the community as a museum and public library. As the years passed, several industries put Linden on the map, including a buggy manufacturer, until another Michigander, Henry Ford, changed the course of history. With the invention of the automobile, Lindenites turned their gaze from the land to water. High quantities of marl were found in area marshlands and another industry, cement manufacturing, would take hold of the tri-county area for the next 30 years. In 1885, the “union block,” which stretched from Bridge Street to Main Street was constructed and used bricks made locally by culling the clay from the earth at the corner of Hyatt Lane and Silver Lake Road. Tragedy struck on May 18, 2007, when residents and other onlookers watched as the union block burned to the ground, destroying forever this part of Linden’s rich history. City officials are currently working with individuals to rebuild on the site of the former union block. The Linden Hotel remains one of the area’s oldest businesses, having served the community for more than 120 years. Down the road, west on Silver Lake Road, in Argentine Township, another historic mill, the Wolcott Mill, was also thriving. Almost 166 years after its construction, the mill has new owners who have made significant inroads into preserving its history. One of the area’s most prominent citizens was former Argentine Township Supervisor Dr. Isaac Wixom, who according to some historical accounts, was the first to invent a prosthetic leg. It was Wixom who first laid out the plans for what is now the main strip in the township before moving on to the Michigan State House of Representatives. In 2018, the city of Linden accomplished numerous projects that improved the lives of residents, and experienced a change in City Council. Federal grants mainly funded the repaving of Bridge Street from the bridge and south to city limits. The Linden Mill Building saw electrical upgrades, and improvements to the furnaces and air conditioning system. The council is searching for ways to plan future improvements for the building. Linden residents voted in a new councilor, Pamela Howd, after Charlie Ross stepped down. In the Nov. 6 elections, Linden saw a high voter turnout at 65.8 percent. Paul Zelenak departed the position of city manager after serving in the roll since February 2013. Police Chief Scott Sutter stepped up and, along with his duties as chief, became interim city manager while the council searches for someone to fill the position. Nicole Wax, owner of Dr. Wax Orthodontics, is working on developing the old Union Block site with a two-story, mixed-use building. The area has been dirt and grass since the Union Block building burned down in 2007, but Wax plans to bring new life into downtown with the development. Holiday Happening, Linden’s Christmas event, saw a record turnout with approximately 5,000 attendees watching the parade, fireworks and participating in the event. Other successful events include National Night Out, the Zombie Walk, Back to the Bricks, and Gus Maker, the annual basketball tournament. Ongoing projects include the construction of the public bathroom at Eagle’s Wooden Park, and efforts to find a road-funding solution to redo the city’s roads. At the end of 2018, construction began on the complex containing Alpine Marketplace, Little Caesars, Snap Fitness 24-7, China Garden, Edward Jones, Rite Aid pharmacy and more.